Hi everyone, today I'm here for Craftie Cafe and I’m making a good luck type of card, using the WPlus9 Little Dreamers stamp set along with the Stardust stamp set. Even though this set looks to be illustrated towards baby themed cards – but the sentiments included in both sets really push the limits with the stamp set and can be used for so many occasions. 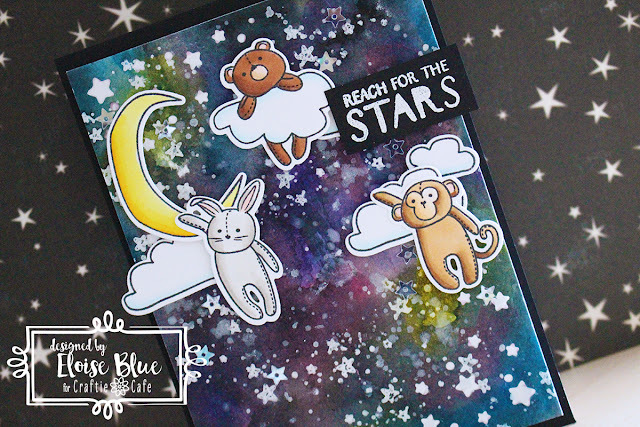 To start off my card I took the stars from the Stardust stamp set and I repeatedly stamped all over the background until it was covered. 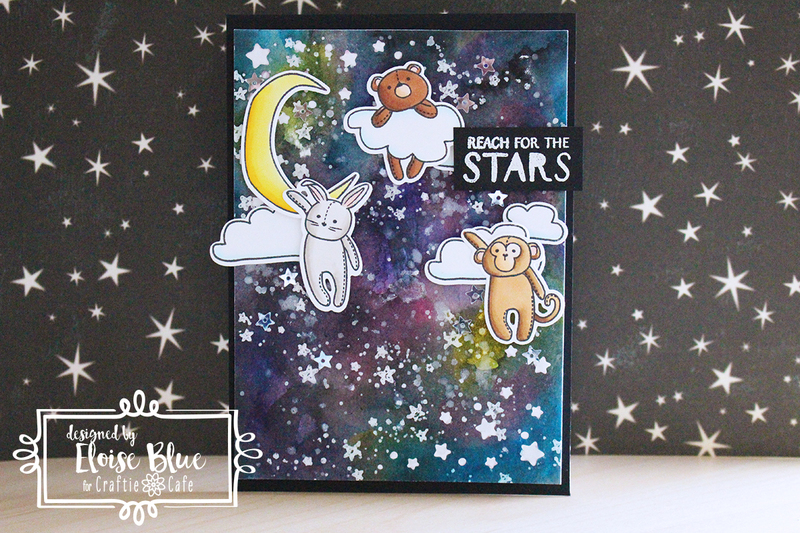 I then used clear embossing powder coat the stars and heat set the background. Once my background was done I pulled out my Mijello Mission Gold Watercolour set and began colouring my galaxy background. I first did two layers of yellow, pink and purple – heat drying in between layers to get the depth and then once I was happy with the vibrancy I went over with a blue and then a black to achieve the full galaxy look. I heat set it once again and then splattered white and shimmer paint to resemble stars. I dried it off again and then used the Starry Skies dies from Lawn Fawn to cut out some stars out of opposite corners of the panel. Once my panel was complete I set it aside and could colour my images. I stamped out all my images from the Little Dreamers stamp set onto some Neenah White Cardstock and coloured them in with Copic Markers. Once they were all coloured I die cut them out using the coordinating dies. Now that everything was ready to go, I added some white cardstock behind my water coloured panel to be able to peak through the die cut stars and then I added foam tape behind the entire panel and adhered it onto a black cardbase. I then used more foam tape to adhere down all my images onto the background. I’m not sure if the galaxy and clouds go together well, but I do like how it turned out, haha! Next up I white heat embossed a sentiment ‘Reach for the Stars’ onto a strip of black cardstock and then adhered it to the card with foam also. To completely finish up my card I took some Multi Medium Matte and Sparkling Clear Stars from Pretty Pink Posh and adhered them randomly over the background and that finished up my card. Thanks so much for stopping by today, I hope you enjoyed and I’ll be back soon!